Price are regular menu price. 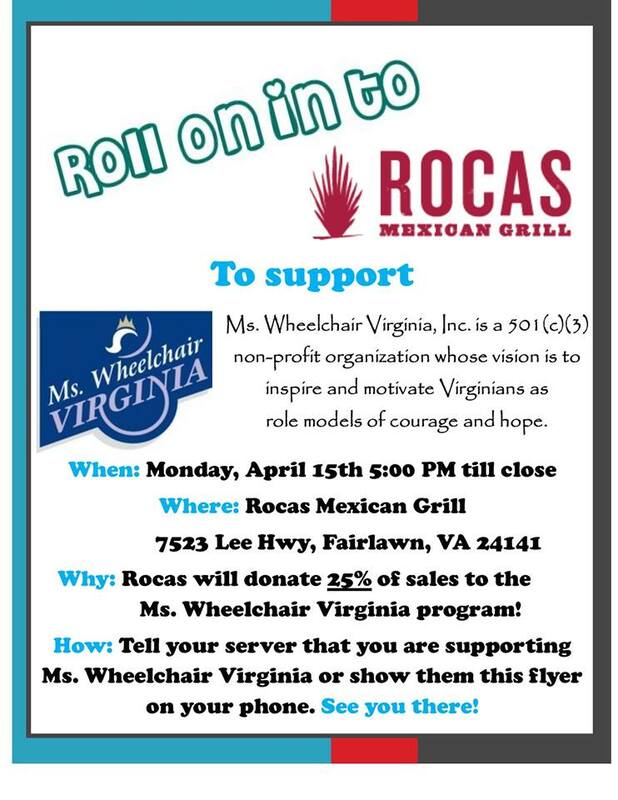 Rocas Mexican Grill hosts a Fundraiser Benefiting Ms. Wheelchair Virginia on Monday, April 15, 2019. Rocas will donate 25% of sales to the Ms. Wheelchair Virginia program! Tell your server that you are supporting Ms. Wheelchair Virginia or show them this flyer on your phone. Ms. Wheelchair Virginia, Inc. is a 501(c)(3) non-profit organization whose vision is to inspire and motivate Virginians as role models of courage and hope. The organization educates, advocates and raises awareness of the abilities and needs of the disability community. To vie the event flyer, visit: https://i.imgur.com/J2yaeko.jpg. For more information on Rocas, visit: http://rocasgrill.com/ or https://www.facebook.com/rocasgrill or call 540-731-4111.